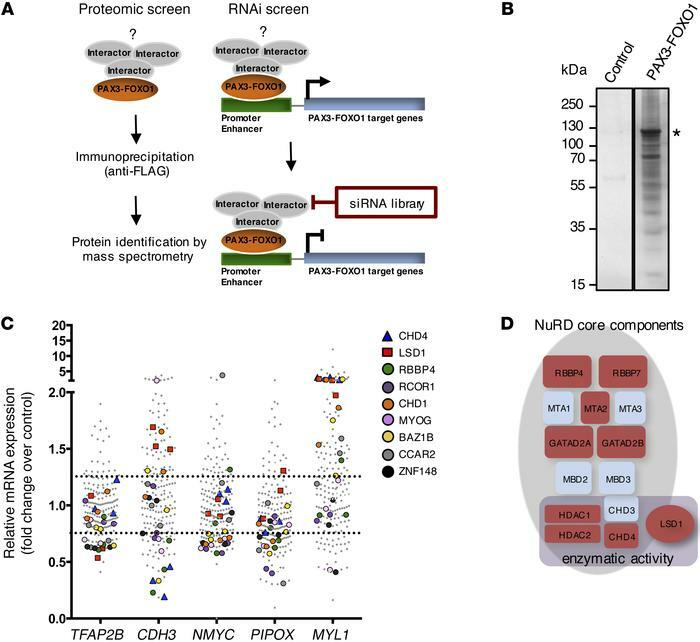 Two-step proteomic and siRNA screen identifies putative PAX3-FOXO1 interaction partners. (A) Schematic representation of the 2-step screening approach. (B) Representative silver-stained gel of FLAG immunoprecipitates from RMS13 cells transfected with FLAG-tagged PAX3-FOXO1. The asterisk marks the band corresponding to FLAG-PAX3-FOXO1. RMS13 cells expressing only FLAG-tag served as negative control. (C) SiRNA screening results for 60 candidate interactors. Each candidate was silenced using 3 different siRNAs per target. Fold change of expression of PAX3-FOXO1 target genes was measured by quantitative real-time PCR relative to RH4 cells treated with scrambled control. Values for the 9 candidate interactors resulting from the siRNA screen are indicated. (D) Schematic representation of the NuRD complex. General subunit composition and components with enzymatic activity are displayed. NuRD subunits identified by MS are marked in red.